I came across Organic Grooming by Herban Cowboy Milled Soap 5 oz when I was desperate for a soap that smelled manly or at least not overly flowery. I was hooked. I use it in every shower and am constantly get compliments from my girlfriend about how good I smell. Organic Grooming by Herban Cowboy Milled Soap 5 oz is organic and vegetable oil based without any dyes of synthetic that could irritate your skin. The milled soap comes in three distinct scents: Original, Dusk, and Wild. I prefer the Dusk which seems to stay with me all day without being overpowering. Organic Grooming by Herban Cowboy has an entire line of products catering to the grooming needs of men; from the aluminum and alcohol free underarm deodorant to scented shaving cream. This brings me to the biggest problem that I have with Herban Cowboy. 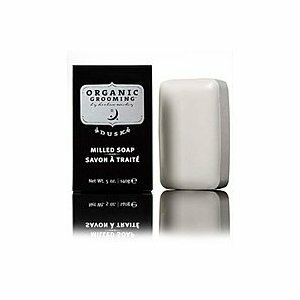 If I use the same scented soap and deodorant together, the smell changes from being perfectly balanced to being overpowering. I counter this by using a milder scented deodorant. Organic Grooming by Herban Cowboy Milled Soap 5 oz has been featured in many magazines including Men’s Health, GQ, and Genre. Organic Grooming by Herban Cowboy have also been used on the set of TV programs such as ER, Dancing with the Stars, and Gossip Girl. As a man, it is hard to find a soap that I like. Many are too flowery, while others are overpowering and artificial (I am looking at you Tag Body Wash). Organic Grooming by Herban Cowboy Milled Soap 5 oz is a great alternative to feminine soaps or harsh cleansers like Dial. Though it is possible to over do it, I believe that this is the best soap a man can buy.